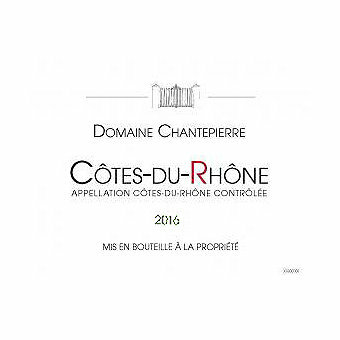 Another outstanding 2016 Rhone red. Another outstanding 2016 Rhone red. Grenache 50%, Syrah 30%, Carignan 10%, Mourvèdre 10%. Domaine de Chantepierre is produced at the Cave de Vigneron de Tavel. The wines are produced from an estate owned by the President of the Cave Cooperative, Christian Padie. Paul Sanches makes the wines from vineyards near Chateaneuf du Pape and Avignon. Stainless fermentation and frequent pumping over the must produces a lush, rich CDR that over delivers for its gentle price.